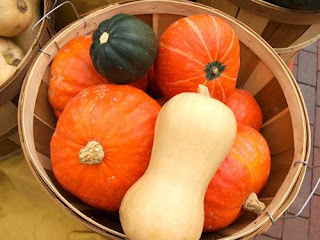 Fairmont Blog: SNACKTIME: Pumpkins, Gourds, and Squash – Good to Eat or Use to Decorate? SNACKTIME: Pumpkins, Gourds, and Squash – Good to Eat or Use to Decorate? The leaves may not turn brilliant colors here in southern California, but you know autumn has arrived when piles of pumpkins, warty gourds, and various shapes of squash – all in shades of green, orange, cream, and yellow make their market debut. Pumpkins, gourds, and squash are all related, but not all are edible. Do you know the difference? Pumpkins are versatile and are used for culinary pleasures and decorating. Roasted or canned, pumpkins contain beta carotene, vitamin C, and fiber and taste great as pumpkin pie, soup, or even added to a smoothie for a seasonal flavor and nutrition boost. Roasted pumpkins seeds make tasty and nutritious snacks! Gourds come in an array of green, orange, and cream. Some have stripes, spots, and/or varying splotches of color with a smooth, horned, or warty surface which makes for an interesting table decoration. Ornamental gourds are not edible and are grown mainly for show. The flesh they do contain is rather tasteless and may even be bitter. Mature gourds can be very tiny from only a few inches long to giants over several feet in length. Depending on the size and shape, unique gourds can become festive table decorations or crafted into bird houses, ornaments, bowls, vases, and more. Many varieties of Squash exist, but most popular include acorn, butternut, and spaghetti squash which are pretty sweet. Upcoming favorites include the Calabaza which looks like a yellow, flat pumpkin. Delicata, also called sweet potato squash because of its creamy flavor and texture, looks like a large, plump cucumber and has yellow skin and dark green pinstripes. Squash may be baked, roasted, pureed, or sautéed depending on its texture. All are good sources of beta-carotene, vitamin C, plus lutein, and zeaxanthin, which are all linked to healthy vision and optimal eye health. So, cook a side dish or create a decoration, bird house, or ornament!